Lots of work has delayed this post by many, many weeks - here's some, o.k. more than some, text reporting the events! Anyway, Turkey, Antalya. 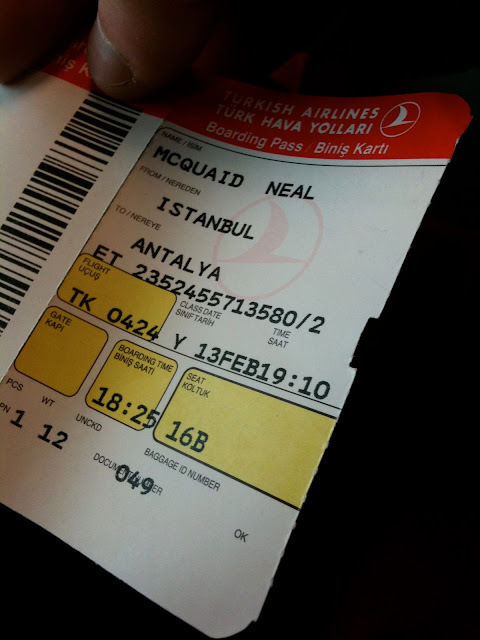 Naomi flew in from Dublin and I flew in from Manchester into Istanbul. Her flight arrived on time and mine arrived 10 minutes before the transfer flight took off. So her bag made it, I barely made, and my bag didn't :) Such is life, and it turns out, a very common problem when flying to Turkey. Lesson to all and something I normally do is bring your harness and shoes in your carry-on…..I didn't this time. doh. So, the first two days involved climbing in a pair of baggy Katana's that had been heavily used for deep water soloing and had the sea-water-rotten rubber to go with it. But this was the only difficulty of the whole trip as other than that, the place is genuinely fantastic. It's the closest thing you'll ever get to a climbing package trip. The taxi driver works for the campsite so drops you door-to-door, the campsite itself is run with German efficiency (by some Germans…..), and the crag is at most about a kilometer from the campsite. At it's nearest, it's 50 meters (see photo below)! In general the rock is un-polished, and consists of a gorgeous European limestone, all orange and white and black and grey streaks of tufas and pockets and edges. Think Rodellar mixed with Siurana, with Siurana steepness (i.e. not super-steep). yes, some of the crag is that close to the campsite. we were staying in one of the huts - super cheap for what you get! This was just a teaser for both of us to see how our climbing had progressed over the winter. Naomi was up for just doing loads of mileage and improving her insights, and I was up for finding a project - scuppered a bit by the lack of gear. Naomi was flying, flashing her first ever 6c+ on the first day, and onsighting another (or was it 2?) later on in the week. A bunch of other 6c's solidified what I regarded as some great improvements for her over the winter. The amusing incident of the week in climbing revolved around the 6th day of the trip, and what was meant to be an easy morning of 6a's and b's to loosen out after two days of climbing before the final full climbing day on Saturday. It all started so well, a nice 6a to get going about 10am in glorious sunshine right at the campsite. And then the slip-up came when a bit of route-finding-errors occurred and I ended up pulling no a teeny mono and edges up a vertical wall. Seemed a bit stiff for a 6a+, I thought, but knew Naomi could have a good go at this so said nothing and lowered off bar a couple of light jokes that it felt a bit stiff as a warm-up! So Naomi fell off about 4 bolts up and and kept fighting. I had to tell her by the 5th that it was actually a 7b+ (nothing like re-reading the guidebook) so by the time she topped out with only a few rests, she seemed pretty happy. I was happy to just onsight a 7b+ as a warm-up this early in the year, and Naomi got a glimmer of what's possible……rule to all that we should remember, every once in a while, get on something that seems way beyond you to see shock the system and see where you stand. For myself, I sent the 7b+ as an onsight warm-up so happy with that as a teaser for the rest of the year, I'm hoping to break into 7c/7c+ insights consistently this year as have never managed it (fallen from the chains twice now). I got onto one project, an 8a. A gorgeous, proud 5-degree 30-meter line up the middle of the crag, consisting of small crimps, monos (6 of them), crap feet and a big rest arms-off rest at half-height. So essentially two 8a's stacked on top of each other as the rest was so good. The session working it went pretty well, lots of tough moves, but all felt do-able, bar a really tough clip way up high. I didn't expect much on the first redpoint the next day but much to my surprise found myself in the mid-point rest feeling very very pumped after making much of the sequences up through the lower half sequence of monos (it involves a clip from dime-edge feet on one of them). A long rest (15 minutes) set me up for the upper section but I didn't expect to get through the clip as I hadn't really worked it and expected to take a plummet with the rope in my hands. Much to my surprise, it all flowed, and I was suddenly at the big large span off the vertical sloper to the final mono and clip completely. Much to my surprise (intentional re-write), I was then taking a plummet after blowing off the sloper. Oh well! On reflection, I did my number one mistake (And has cost me a few times a route) of taking my foot off the gas a bit as feeling confident and not sending the route to the chains. I tried to flow through the moves, but really should have ripped every. single. hold. off the wall. The final attempt at the end of the very last day ended up with me completely gassed coming into this sequence and the pay-back of the not-really-a-warmup-day-doing-7b+=onsights showing as my ran out of steam. Such is life, and as a teaser of how I'm climbing, it bodes well for the year. A major positive was that I feel much better on crimps now for recovering which had been one of the goals for the winter to improve on. It's still not to where I want it, but it's moving in the right direction. I found that I've developed a bit of that power that is required for pulling down on tufas also - again, needs more practice. I also need to spend some time projecting routes at the wall to get that killer instinct, I didn't really have that dialed in and it cost me the route. To my disappointment, I'd hoped to work an 8a+ or 8b but they were all seeping badly after the winter rains so can't complain with the outcome. Hopefully I'll get some time at Malham or Raven Tor in the coming weeks to sort that out, although there's a few 8a's I'd like to tick first there. fly to Antalya (there are some charter flights but most seem via Istanbul), and organize either a taxi through Josito campsite (see below) or yourself. We paid about €250 return. Two campsite options currently, and one place opening this April (2010). The Climbers Playground and Josito camping. We stayed at Josito's in one of the 2-person huts, about €20 a night for the whole huts. You can eat entirely at Josito's, we did. Breakfast is maximum €3.50, coffee €1.50, lunch is €3.50 (and enough for two people), and dinner (two courses) is €6-8.50. Beer is €2. You can get basic supplies there, milk and break, but you will have to go to the nearest town about 6-8kms away if you want a supermarket. We didn't want to waste time so enjoyed the fantastic food of the campsite. I've heard the other campsite has free milk and break for breakfast so might be a bit cheaper but Josito's facilities are amazing and the people we met from the other campsite used to come to Josito's as said the other was much less lively for social gathering.